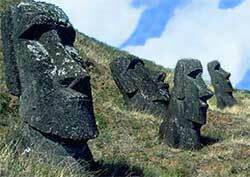 Easter Island is noted for its stone human statues (called "moai") carved from volcanic rock. Summer or winter? Which is best? Climate plays a major role. The Southern Hemisphere summer (mid-December to mid-March) has the best climate - expect clear skies and comfortable temperatures. Yes, must-see sites can sometimes be populated with tourists in the summer, but not as much as you would experience in most other major wonder destinations in the world. Key reason: The island’s extreme remoteness prevents mass tourism. Tourism appreciably thins the rest of the year, but I don’t recommend coming then. On Easter Island, you do a lot of outdoor sightseeing, which can become unpleasant because of chilly, ground soaking winter rains during the off season (especially from April to July). The moai number nearly 1000 and dot the hillsides above the rocky shores. The biggest standing moai is 10 meters (33 feet) tall. An unfinished moai in the quarry is over twice that length and would have weighed about 135,000 kilograms (150 tons). The moai's purpose is a mystery. The most popular theories say they depict gods or ancestors.